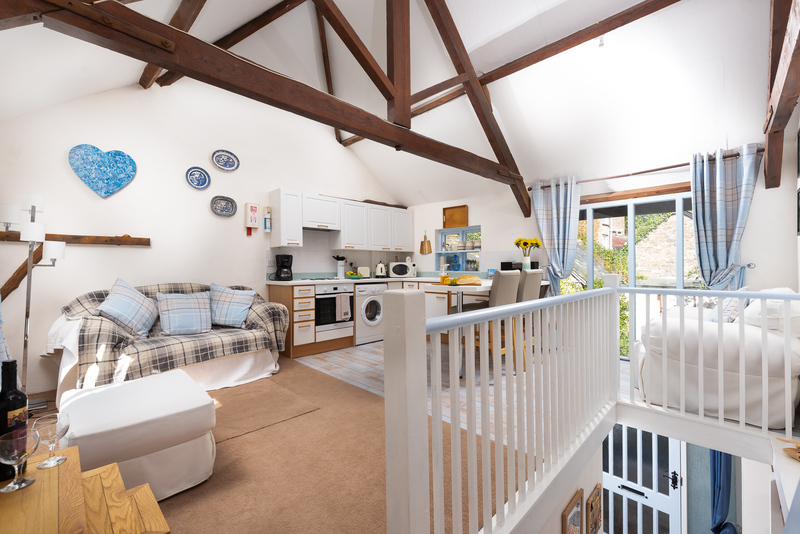 If you’re looking for a peaceful retreat, away from it all,then Bluebelle Cottage is just perfect. 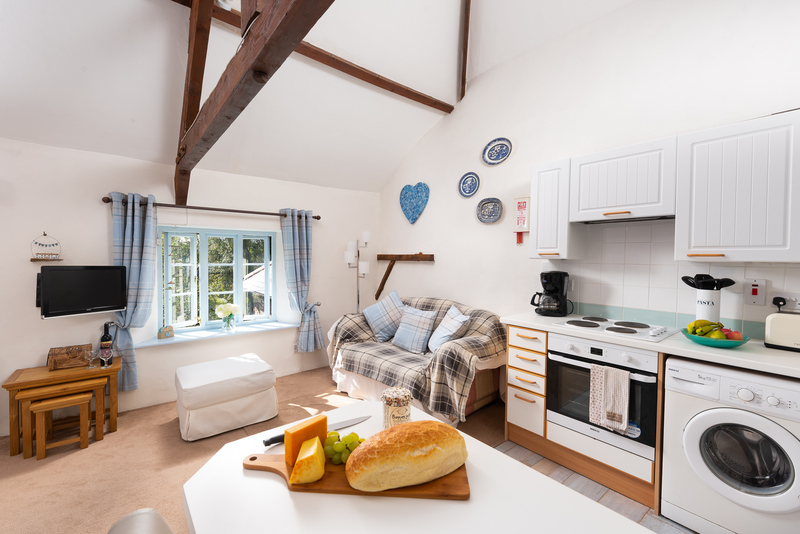 This one-bedroom cottage is set in a lovely converted farm yard, with the other old farm buildings having also been lovingly converted into picturesque cottages. As you enter the courtyard, Bluebelle is tucked away in the left-hand corner. You enter the cottage into a pretty hall-way with coat hooks and a place to store boots after a days walking. 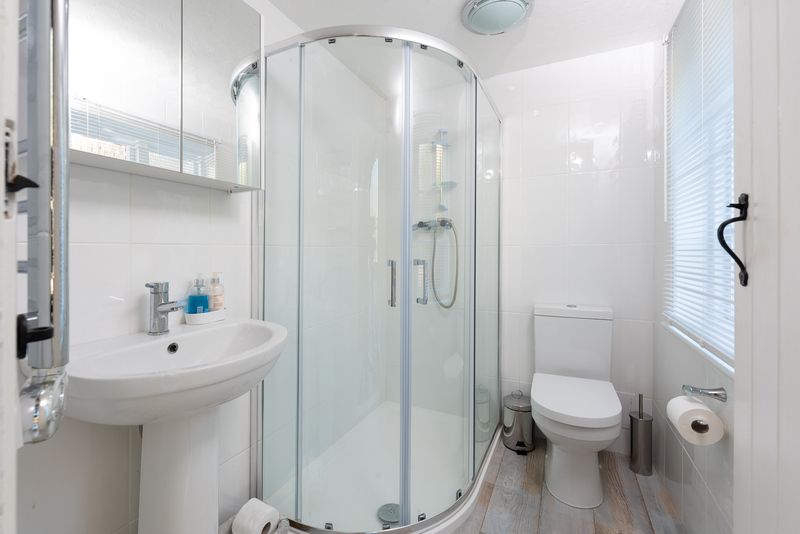 The lovely bathroom is located to the right and has a curved shower with detachable head, there is a WC, basin and heated towel rail. There is a step down to a bright bedroom with small,king-size bed that can be split into two singles. There are two bedside tables with lamps and a chest-of-drawers. There is a window seat which over looks the lovely rear garden which can be accessed via a door off the bedroom. 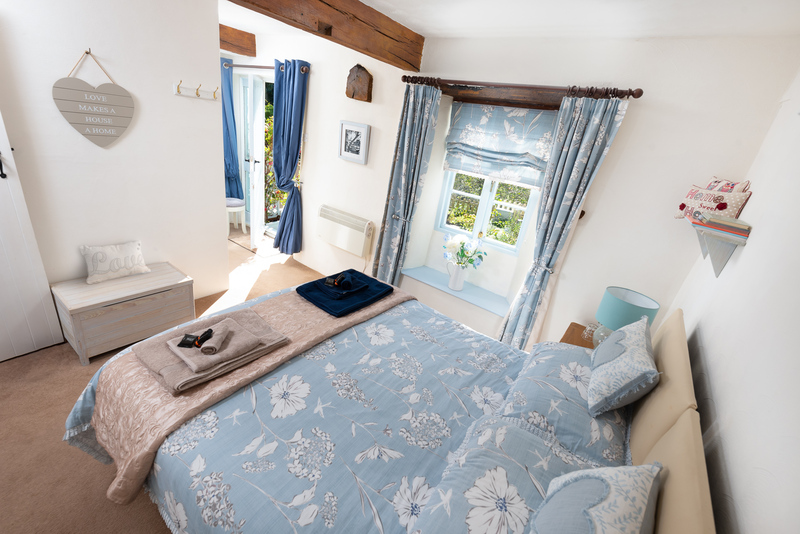 The cottage has retained the original French beams in the bedroom and upstairs. The stairs leading to the first floor living area has lovely photographs and paintings of the area. 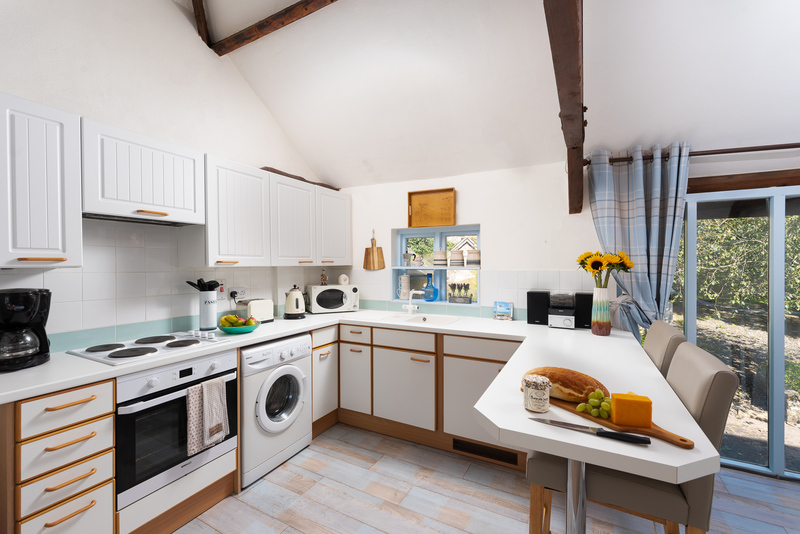 The open plan living area is split into a bright well equipped kitchen with loads of storage space and an electric cooker, fridge, microwave, double toaster and washing machine. 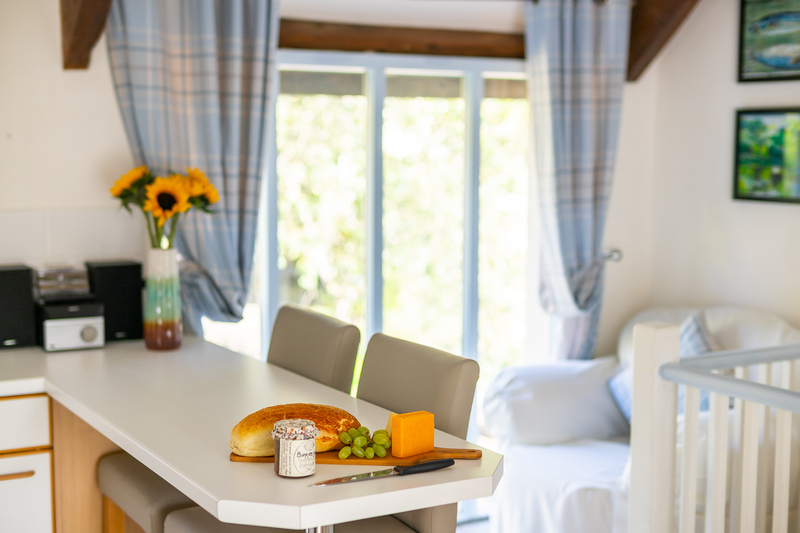 There is a handy breakfast bar with four chairs, ideal for relaxed meals. The lounge area has a double sofa with reading light and is next to the floor-to-ceiling window overlooking the courtyard and countryside beyond. There is another arm-chair and nest of 3 coffee tables in the other corner which overlooks the front courtyard. There is also a wall mounted TV and DVD. To the rear of the cottage is a pretty enclosed garden with garden furniture and plants and a path leading away from the cottage and the woods beyond. Bedroom: Small king size bed (which can be separated into two singles). Fully enclosed rear garden with small fence and gate. Electric heaters, electric oven and hob, toaster, microwave, coffee machine, fridge with freezer compartment, washing machine, TV/DVD, CD player, WiFi, bed linen and towels provided, travel cot (please bring your own cot bedding), high chair, iron and ironing board, BBQ, short breaks available, 24 miles from the coast, 1 mile from the nearest pub, enclosed rear garden, off road parking for one car, anchor point in front courtyard by studio for bikes, no smoking, weekly changeover is Friday, dogs welcome, supermarket delivery. Set in the heart of Mid Devon’s countryside between the two National Parks of Dartmoor and Exmoor, the North Devon link road (A361) is within easy reach as well as the beaches on the North Devon coast. 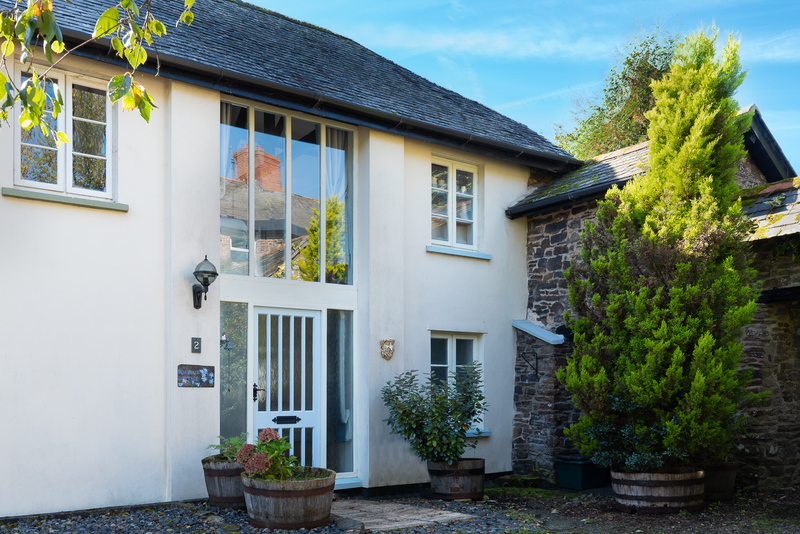 Just one of a few picturesque cottages situated in a lovely converted farm yard, just a mile from the small Devon village of Chawleigh and 2.5 miles in the opposite direction from the larger village of Chulmleigh. Chawleigh boasts a great community spirit, with a pub, church and village shops whilst the larger village of Chulmleigh also features charming thatched cottages, traditional inns and local independent shops. 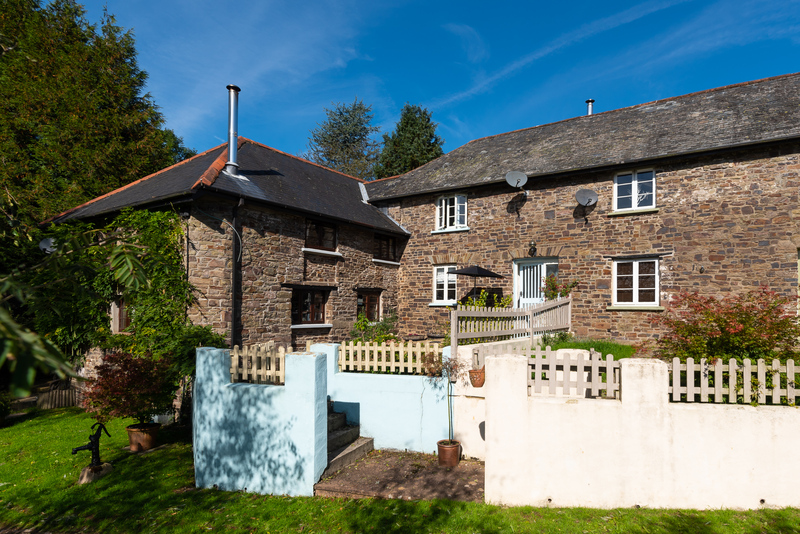 This area includes many excellent walks, cyclists routes and a number of golf courses and is an excellent choice for those looking for a quiet rural location to explore the wonderful North Devon countryside.